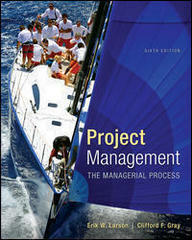 Project Management 6 Edition Do you want to be a Certified Project Manager? This book combines operational and human skills into flexible, proactive framework. It focuses on the human element that is critical to project implementation and completion. It also provides an intuitive five-step approach for collecting the necessary information to plan, schedule, and control a project. Also features examples, case studies, and analysis for each phase of a typical project, to ensure that each project you manage meets its goals on time and on budget. Provides proven guidelines for managing projects from both the operational and behavioral standpoint.